Two things came to mind this morning. 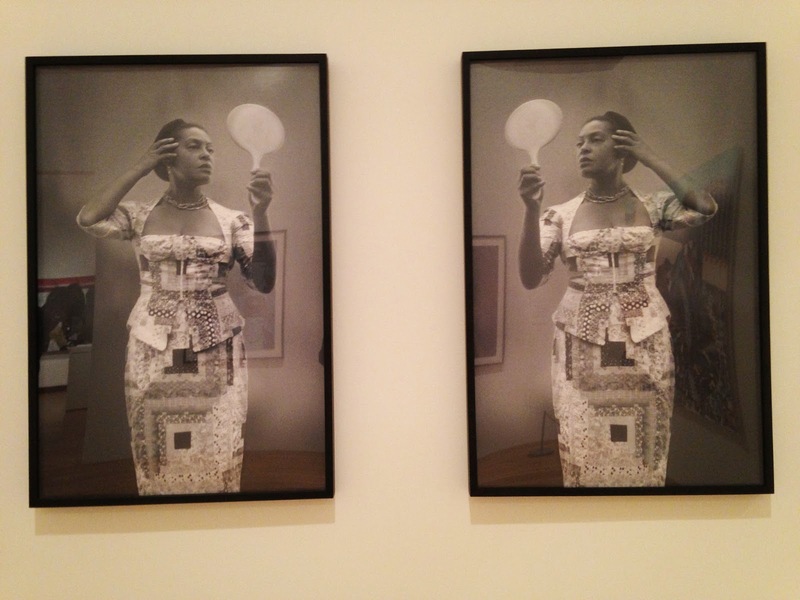 The first was this fabulous work by Carrie Mae Weems that I saw when visiting the Nasher Museum at Duke University last month (Thank you Damien!). The second was a poem I wrote in 2003, “Lucy Speaks to Hegel”. I loved these images the moment I saw them and wanted to be in them. So much so, I took a picture with me in the middle. The title, “I Looked and Looked to See What So Terrified You”: no matter how hard I look, I can’t find what terrifies you because all I see is this glorious African beauty of mine, that is me. Yet, I know that this is the very thing that has and will always frighten you. Because if you look in the mirror, you’ll see the other women behind me marveling at themselves as well. As a devotee of the orisa Osun, this work made me smile and be grateful for the beauty and power of Black women all over the world. I mean, look at that outfit, her hair, her stance. ...But if you happen to have the blessing to have been born Black and the extra blessing to have been born a female and an American, then each filament of power you have, you have laid it and layered it carefully, not like someone from a family whose name makes people shiver in the marketplace--Rockefeller, DuPont, Kennedy. Every time I look at a copy of this work, I hear Osun laughing out of the walls, out of my skin, my spirit. She says, if you really want to see what I see in the mirror, look into the Earth’s core, what lies beneath the ocean, what rests quietly at the center of the tornado, what floats on the wind, the silence in a sigh. I dare you. At the time I wrote the poem in response to this I was studying archaeology at a summer institute on Africa and we were on about the discovery of Lucy. Lucy, Australopithecus Afarensis, discovered in 1974, is the ape who stood up, and the benchmark by which all other hominid discoveries were made at that time. I remember thinking then how all the world had been born from what we now know as Africa. And, I remember thinking how “Lucy” couldn’t speak for herself after so many centuries, but that didn’t mean she wouldn’t be amused. What would Lucy say to Hegel? The day I walked, Africa birthed the beginning of the world. that only the goddess herself can shape them with her fifth eye. how to speak and write when I stood straight. I might have remained on my hands a few centuries more. your blood makes you as African as djembe. there would be no Asia, no Europe, no “these” United States. you would have never been born. Yes, to know our inherent worth – separate from all things and other people – is to also know our place in history and the Universe. When you read textbooks, you understand how difficult knowing our inherent worth becomes: we are absent, invisible, silent, remade in someone else's image. But, our mamas (and papas) didn't raise no fools! We eventually learn and know that we don’t go to the texts to know this history. We don’t even go to the mirror because so often we see only what the mirror maker wants us to see. We must go to each other. WE are the ones we’ve been waiting for. Indeed. Everything we need to know is written on and in us. We are as old as the oldest trees. Some of us are the trees, roots digging dip into the volcano that is this planet or out to the stars. We have only to look at each other, with Love, to know fully the power we have to change the direction of the wind with our breath. And, if you are a mother or have ever witnessed a birth: you know the power to manifest life through breathing. A few year’s ago, my Osun asked me to put up a full shrine and share it with a close group of sister-friends. She reminded me of who I was, who I was with these women, and they with me. I AM OSUN’S daughter, full of the breath of life and energy of creation. All that I am is contained in the eye of the Universe, the unspoken names of Olodumare, the mud hands of the Earth Mothers, the silent movements of the Iyami Aje, the transformational power and love of the orisas, the wisdom of the Ancestors. And, I am not alone. I know this because I see my Sister-friends every day. Ase-O! My Sisters. Meet you on the Path of Life.